UTEP’s Centennial Plaza has lived up to its promise as “UTEP’s living room” since it opened officially in April 2015. The plaza is an ecologically sustainable setting where students, staff and faculty can re-energize their batteries. The University has used the oval plaza, which is about 2/3 the size of a football field, for such popular activities as back-to-school welcoming events, campus health fairs, international food fairs, and Movies on the Lawn, but it also has been a magnet among individuals, friends and community members who want a place to relax, stroll, eat, throw a Frisbee, or take photos. The plaza’s chameleon-like abilities have earned rave reviews from those who use it, as well as recognition from state and international organizations that have looked at its landscaping plan. 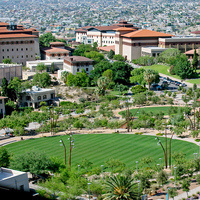 The latest and most prestigious honor is from Green Business Certification Inc. (GBCI), which announced that UTEP’s Campus Transformation project, which includes Centennial Plaza, is the first project in the world to earn a SITES Silver Certification Award for achievement in landscape sustainability. Excellent, thank you for putting this event together!